Whitley Bay's Callum Patton on the ball against Guisborough. Whitley Bay earned a creditable draw from an entertaining midweek game at top six side Guisborough Town. With his team having guaranteed first division safety two days earlier, Ian Chandler was able to rest several key players from his starting line-up with one eye on Saturday’s League Cup semi-final at Marske. Guisborough defend a corner against Whitley Bay. Guisborough are chasing a third place finish, but like Whitley they are in the middle of a punishing schedule of fixtures and made several changes to the side that defeated West Auckland on Monday night. Torrential rain and sleet during the late afternoon gave way to sunshine and blue skies before kick-off, leaving the pitch in surprisingly good condition. The home side had the better of the opening exchanges, creating several good chances and deservedly took the lead after ten minutes when a hesitant Whitley defence failed to clear a right wing corner. The ball was headed back across goal and Gerard Livingstone had the easiest of tasks, heading home from four yards. Whitley gradually settled into the game and the home side were forced back on the defensive by the midway point of the half. With 25 minutes played, Callum Patton played Nikolay Ivanov through and the Bulgarian fired just wide. Starting only his third game, Ivanov was beginning to pose a real threat and on the half hour his ball across the face of goal was kept out by defender Anthony Snook at the expense of a corner. Stuart Bramley and Aiden Haley both went close for Whitley but when play switched to the other end, Tom Flynn did well to push Danny Earl’s shot wide. Whitley came back strongly and after Haley brought a fine save from Liversedge, Patton’s first time effort flew over the bar. It was a real end to end game now and Earl had another attempt blocked shortly before the interval. Playing down the slope in the second half, Whitley began well quickly, forcing two corners, but a disciplined Town defence eventually cleared their lines. The game was now being played largely in the Guisborough half and two substitutions in as many minutes saw Chris McDonald and Alex Kempster replace Steve Gibson and Glenn Reardon. Patton had been looking lively all game, working hard and creating chances, and shortly after the hour mark he drove a strong shot narrowly wide, but with 65 minutes played, the Bay striker was tripped inside the box by defender Leon Carling. Although regular penalty taker Adam Shanks had just come off the bench, Patton took the spot kick himself and beat the dive of Liversedge to level the score. The equaliser was no more than Whitley deserved and it set up an exciting final 25 minutes. Both sides were going for the win and there were chances at both ends, but it was Whitley who looked the more likely to grab a winner. Patton was unlucky to see his shot hit the top of the bar following a cross from McDonald, and moments later the deadline day signing from Morpeth again went close, his powerful shot being blocked. Guisborough responded well and ten minutes from time it was their turn to strike the woodwork when May’s header crashed off the bar from a McWilliams free kick. Back came Whitley and Ivanov went close after being played through by Patton. With time running out, Snaith had a goalbound effort finger-tipped wide by Flynn while Kempster’s teasing cross was almost poked home by Ivanov. Into stoppage time, Whitley nearly snatched a dramatic winner when a high, looping ball from out on the right ended up in the net, but the goal was ruled out with Bramley deemed to have impeded keeper Liversedge. A draw was the least Whitley deserved following their excellent second half display, but Guisborough also created plenty of chances in what was an open and thoroughly enjoyable, competitive game. The whole Bay squad performed well, with Patton outstanding, while Ivanov and Haley were two others who particularly caught the eye. Chandler was delighted with the performance while Guisborough boss Steve Dowling readily acknowledged that Whitley were the better side in the second half. 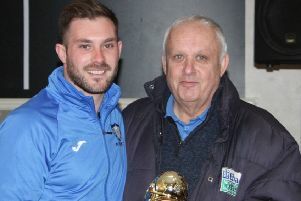 Bay fans who braved the horrendous weather on their way to the game were certainly rewarded for their efforts as Whitley continued their remarkable run of results at the King George V Ground, where they have lost just one of their last seven. Whitley Bay: T Flynn, Munro, Day, Gibson (McDonald 52), Bramley, Haley, Berry (Shanks 64), Fowler, Ivanov, Patton, Reardon (Kempster 54). Subs not used: Gladstone.